§L-R: Head, Protocol Unit of NIMASA, Ms Kehinde Bolaji; Director, Shipping Development, Captain Warredi Enisuoh; Australian Deputy High Commissioner, Angela Tierney; Director General, NIMASA, Dr Ziakede Akpobolokemi; Executive Director, Maritime Safety and Shipping Development, Captain Ezekiel Bala Agaba and Assistant Director, Maritime Labour Services, Mr. Chiroma Ibrahim when the Australian Deputy High Commissioner paid a courtesy visit to the Agency. L-R: Executive Director, (ED) Admin and Finance of NIMASA, Haruna Baba Jauro; Director, Shipping Development, Capt. Warredi Enisuoh; Counsellor Petroleum and Commercial Affairs, Norwegian Embassy, Mr. Tor Tanum; Norwegian Ambassador to Nigeria, Mr. Rolf Ree; DG/CEO, NIMASA, Dr. Ziakede Patrick Akpobolokemi and ED, Maritime Safety and Shipping Development, Capt. Ezekiel Bala Agaba during a working visit by the Ambassador to the Agency. 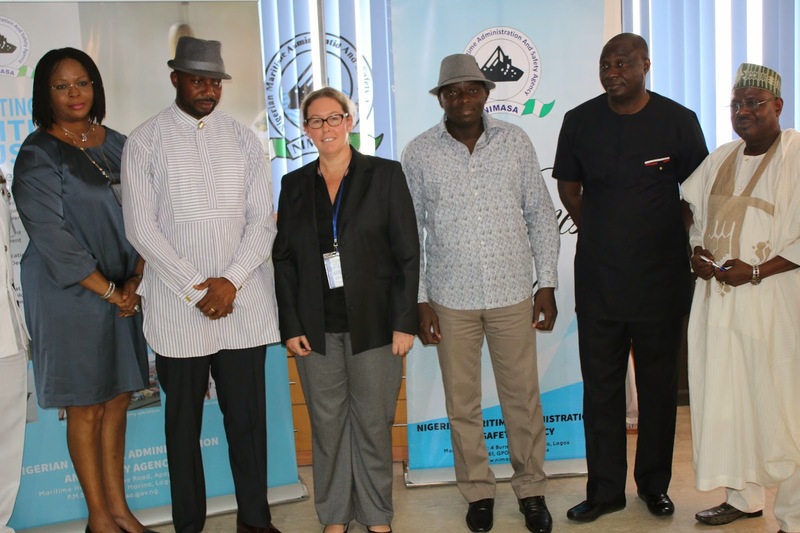 The Australian Deputy High Commissioner to Nigeria, Angela Tierney on Tuesday said her country would partner with the Nigerian Maritime Administration and Safety Agency (NIMASA) in technical support provision and human capacity development. This is contained in a statement issued in Lagos by the Deputy Director and Head of Public Relations of NIMASA, Mr Isichei Osamgbi. According to the statement, the envoy, who was on a visit to NIMASA headquarters in Lagos, commended the human capacity building drive of the Agency. She expressed her country’s willingness to work with NIMASA in building the requisite capacity for the maritime industry. The statement said the Norwegian Ambassador to Nigeria, Mr Rolf Ree, had earlier visited the Agency and also stated his country’s readiness for the provision of technical support to NIMASA. According to the statement, Ree said the support was towards realising the full potentials of the Nigerian maritime industry. Director General of NIMASA, Dr Ziakede Akpobolokemi, while receiving his guests, expressed willingness to partner with major maritime nations such as Australia and Norway particularly in the area of capacity building, the statement read. “Australia is a nation that enjoys high respect among the comity of maritime nations. “Partnership with your country will surely help us realise the potentials of building a competent workforce that is poised to take the Nigerian maritime sector to greater heights,” the statement quoted Akpobolokemi. He urged them not to relent in their support, as such will continue to help in growing maritime nations like Nigeria. The DG assured the Envoys of improvement in monitoring Nigeria’s maritime domain in real time using satellite surveillance system that covers the whole of Nigeria’s coast and the Gulf of Guinea, the statement said. According to the statement, the NIMASA DG said that the progress should attract more commercial activity from around the world.